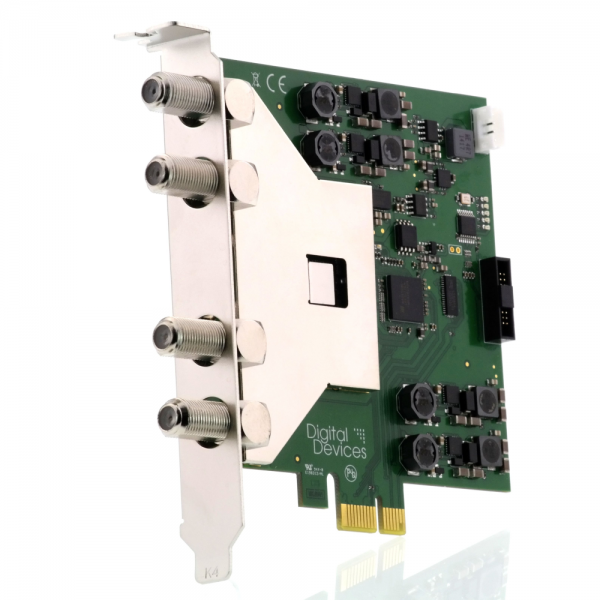 Product information "8 Tuner TV Card - DD Max S8 (4/8) - Full Spectrum"
Digital Devices MAX S8 DVB-S2 (4/8) comes with 8x DVB-S/S2 tuners on only one PCI Express card. With the Digital Devices MAX S8 Digital Devices presents an HDTV tuner card for the PCI Express slot with eight TV tuners. The ultra-compact design, only 5 watts power consumption, the choice of operating mode and support for the single-cable solutions according EN50494 (Unicable®) and EN50607 (JESS®), allows a flexible use in any situation and for any solution. Suitable on Windows XP, Windows Vista, Windows 7 and Windows 8(.1) and Linux, the Digital Devices MAX S8 can be integrated by flexible selection of the operating mode individually in the environment. The operating modes allows a single-cable mode according to EN50494 (Unicable®) and EN50607 (JESS®), the use of quad LNBs and 4 lines from multi-switches and Quattro LNB's or master output of a multiswitch. The Digital Devices MAX S8 can be used immediately with numerous TV applications. Favorite products are for example DD-TV, Windows Media Center, DVBViewer, MediaPortal, Gen2VDR or MythTV. Use this option if you want to connect your Max S8 to a normal multiswitch or LNB with integrated multi-switch (QUAD LNB or OCTO LNB). For both cases, four SAT lines are required to provide a full-featured and full reception (all four levels SAT). Use this option if you want to connect your Max S8 to a multi-switch, which can be cascaded. Such multi-switch have in addition to the inputs for a Quattro LNB, four outputs which are also known as "cascade outputs". These outputs give only from a Quattro LNB received signals unaltered out again. Alternatively, the four outputs can be directly used by a Quattro LNB without multiswitch. in this operation mode the card can be used over only one antenna cable via Unicable®*1 oder JESS®*2 supported equipment. Thereby it is possible to provide up to 8 Tuners by a UniCable® System and up to 32 Tuners with a JESS® System. More than one satellite can be used in this mode. The Digital Devices MAX S8 is available with numerous TV applications. Products used are, for example, DD-TV, Windows Media Center, DVBViewer, MediaPortal, Gen2VDR or MythTV. Related links to "8 Tuner TV Card - DD Max S8 (4/8) - Full Spectrum"